The return of warmer weather in recent weeks means spring has finally sprung. For the Bitbucket team, this is the time of year we are especially reminded of the potential in clearing out clutter in your day-to-day, giving you back time to do the things that truly spark joy. Over the past few months, we’ve been burrowed indoors busy working on new features that will help you and your team automate the most tedious parts of your workflows, connect more seamlessly with third-party tools, and work more collaboratively. 1. Smart Feature Branching: Good branching practices are key to a strong Git workflow. That’s why Bitbucket has always been invested in helping teams build powerful and efficient branching workflows. Last year, we announced branching model support, which made it easier to make consistent naming decisions when creating branches. Now, we’re releasing additional functionality to make it easier to build and use a branching workflow with your team. When you configure a new branch, we will take your existing branching model settings into account to make smarter defaults for your branching flow. We’ve also made some additional changes to support standard Gitflow and other branching flows from planning through to production. Smarter Defaults: Bring smart, automated source and target branch selection to your flow. Based off your configuration choices, Bitbucket will now save you time by automatically suggesting the source when you create a new branch. When you’re finished working on the branch and create a PR, we will also suggest the target branch from your branch type. Filtering in Branch List Page: Save time with more granular and accurate search results on the Branch List page. We’ve now added the ability to select the branch type. Before, if you were to look up release branch types, you would see results by text match (i.e. everything that matched the word “release”). Now, if you select “Release,” only release branch types will be shown on the page. If you want to multi-task, you can now also search for multiple branch types at one time! Branch Permissions by Branch Type: If you have your branching model configured, you can quickly browse and set your permissions based off these naming conventions. The permissions will be linked to your configuration, eliminating manual typing, browsing, and chance for error. After you select the branch type, simply select the group you’d like to give permission to and lock that workflow down. 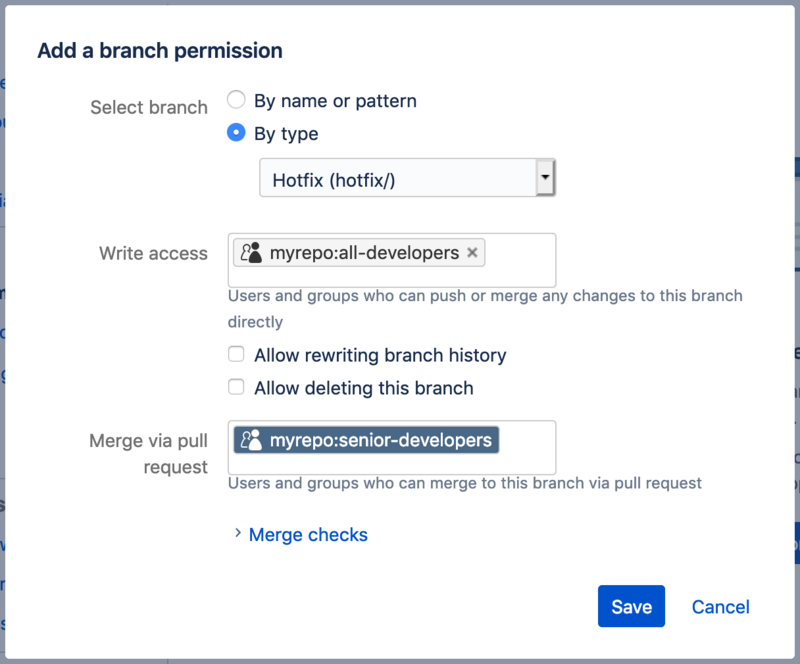 Because branch permissions and your configuration are linked, even if you decide to change your branch name settings, say from “hotfix” to “hot,” your permissions will remain unaffected. 2. Bitbucket for Gmail: Our new feature-packed Atlassian Cloud for Gmail add-on allows you to take action on and get contextual Bitbucket information without leaving your inbox. You can read all the comments on a Bitbucket issue, view information about a pull request or build, or even see who has or hasn’t approved a pull request, all from within Gmail. The Atlassian app also integrates with Jira, allowing joint Jira and Bitbucket Cloud users to get a full picture of the status of their work on the go. 3. Further Integration With Jira: We’ve now leveled up the integration between Jira Software Cloud and Bitbucket Cloud so teams can gain continuous visibility from their backlog through to release. Teams can now see Bitbucket Pipelines release information within Jira Software. In Bitbucket, teams will be able to see Jira issues within the Deployment preview screen. 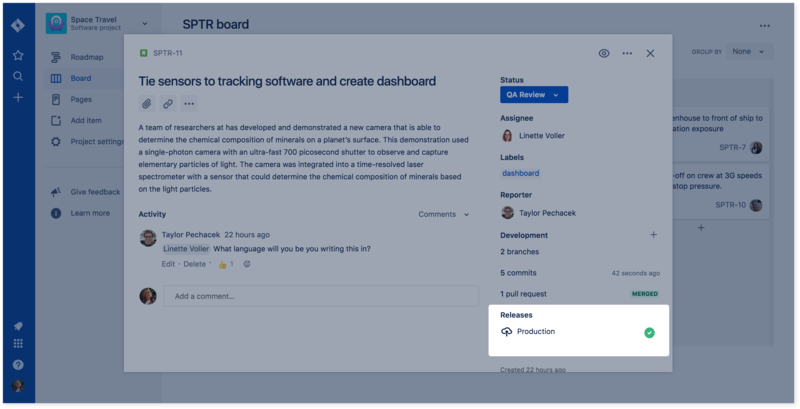 Release status at your fingertips: Release information that was once locked in your deployment tools, only visible to your dev team, is now visible to any team member working in Jira Software. Deeper history of releases: Understand the history of releases by clicking on the release status and view all of the environments – test, staging or production – that each issue has been deployed to, along with information about when the changes were deployed to that environment. 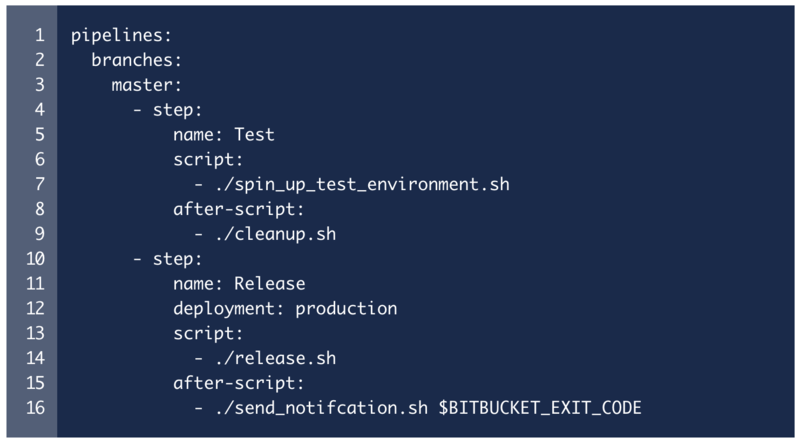 Jira x Bitbucket in Deployment: Using the Deployment preview, development teams can quickly validate what code they are about to promote to another environment before hitting Deploy. This preview provides them with all the associated commits, diff, and now Jira issues, for a higher level of context. By clicking on the issue key, they can view and even edit the Jira issue without leaving Bitbucket. 4. After scripts in Pipelines: Bitbucket Pipelines now supports the ability to run scripts at the end of a step execution, regardless of whether the step has failed or succeeded, using the after-script keyword. A BITBUCKET_EXIT_CODE environment variable is also exported, which contains the status code returned from the last command run in script. The commands in the after-script section run until one fails, and the result of this section does not affect the overall build status. 5. Faster feedback on merges: We’re excited to be delivering on our highest voted feature request for Bitbucket Pipelines! You can now configure Bitbucket Pipelines to run when you create or update a pull request, providing developers a faster feedback loop on breaking changes and giving reviewers more confidence when approving changes. With a pull-requests pipeline, a temporary merge containing the changes in the pull request and the destination branch is created, and the defined pipeline is run on the merge result. By doing this, both the pull request creator and reviewers can confirm changes are valid, that the code builds, and tests pass before the pull request is merged into the destination branch. 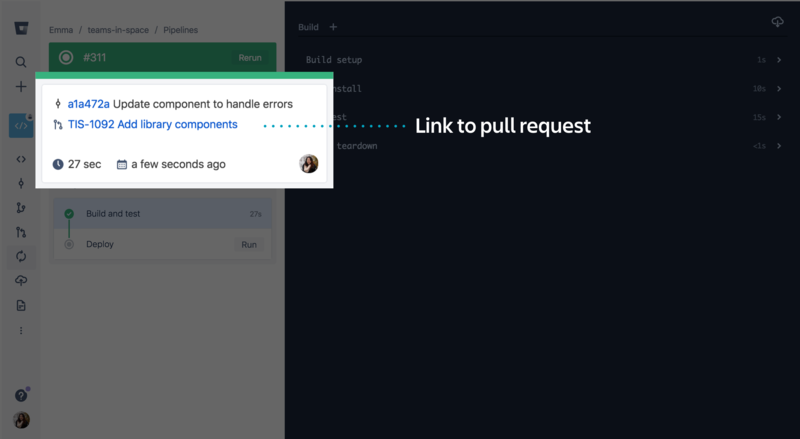 This helps developers prevent errors earlier in their workflow and gives reviewers more confidence when approving pull requests. The pull-requests pipeline also gives you the flexibility to configure certain pieces to run only when the changes are ready to be merged. 6. Default Pull Request Descriptions: Repository admins can now add predefined text to all new pull requests with the Default description repository setting. Remind authors to include additional information (i.e. screenshots, links, business context about the change, testing notes) to help reviewers understand the proposed changes more thoroughly and complete code review more quickly. Ready to take these features for a spin? If you’re new to Bitbucket, sign up for a Bitbucket Cloud account. Already a Bitbucket customer? Check out the individual blogs for instructions on enabling your desired feature. Have more specific questions about this post? Reach out to us on Twitter to get the information you need. Denise is a Senior Product Marketing Manager for Bitbucket. She has over six years of experience across content marketing, lead generation, and email marketing. When she's not experimenting with new marketing strategies, you can find her snowboarding, hiking, or exploring local coffee shops.